Bibliography: Focillon 24; Hind 1; Wilton-Ely 26. 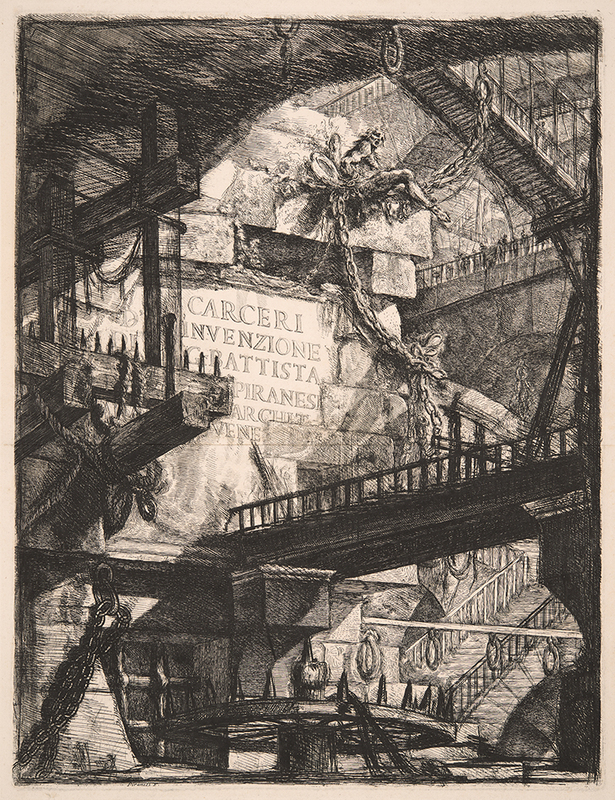 Imaginary Prisons of G. Battista Piranesi, Venetian Architect: title page, . From Carceri d’Invenzione di G. Battista Piranesi, Archit[etto] Vene[ziano]. Etching on laid paper. Eighth of nine states. Plate: 545 x 415 mm (21.5 x 16.3 in.). Sheet: 703 x 509 mm (27.7 x 20 in.). DAC accession number 1973.D1.38.1. Gift of George W. Davison (B.A. Wesleyan 1892), before 1953. Open Access Image from the Davison Art Center, Wesleyan University (photo: M. Johnston). http://dac-collection.wesleyan.edu/obj10880 is a persistent link to this page with no user-session information.